For some reason, I feel like I don't drink near enough Belgian beers despite the awesomeness they can have. The bulk of the beers I drink are from California or the Northwest/Rockies, which is kind of sad now that I think about it. Anyway, enough whining and beverage introspection. Here we have an impressive Belgian Quadrupel Ale from De Leyerth Brouwerijen (Urthel), founded by the wife and husband team of Hildegard and Bas van Ostaden. The rumor is that they have been seeing many a small people around their area of Flanders (yes, like Ned Flanders of The Simpsons) who are called Erthels, and have been seen drinking copious amounts of brew. Well, it's likely this is just a marketing story by the husband/main brewer Bas. But hey, in both Ireland and Iceland people claim to see little people running around, too, so maybe it's just all the high quality booze in their bloodstreams. Hildegard, the other half of the relationship, used to teach brewing at a school and was a consultant to La Trappe, so the team's merits stand strong regardless. 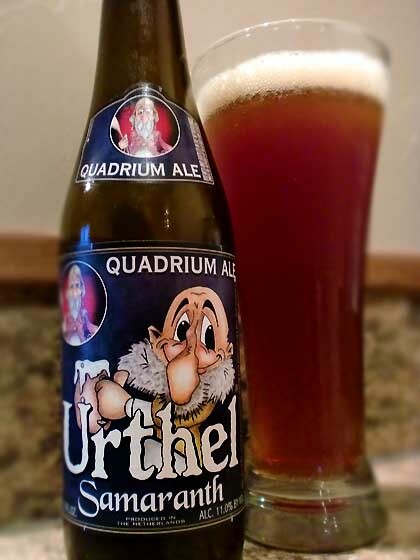 This is the Urthel Samaranth Quadruple Ale, with a Quadrupel of course being the big daddy of the Belgian beer world with higher ABV and stronger flavors than Dubbels, Trippels, or the standard brews. This particular beer is bottle conditioned, which means that yeast is added after fermentation to naturally carbonate it, generally making it more flavorful in the process. Urthel Samaranth Quadrium Ale pours a murky copper color. It has aromas of dark fruits (red wine, figs, plums), caramel, and the typical Belgian funky sweetness from the Belgian yeast. You take a swig and get a sweet, fruity, brown sugar malty mouthful of brew with notes of cherries, red grapes, bananas, toffee, and some earthy spiciness almost like clove. The finish is a little bitter and biting from the alcohol, but not overtly so. Drink This: if you want a strong and full-flavored Belgian Quadrupel Ale to keep you warm during the cold winter months.